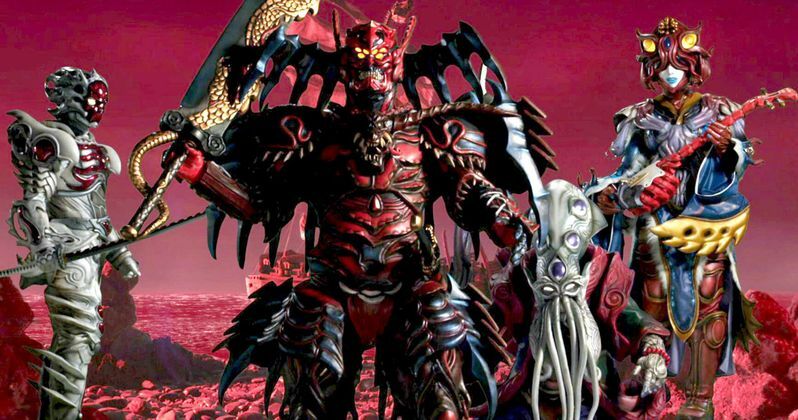 Power Rangers Movie Villain Revealed? "A huntress. A striking, yet subtly alien-looking woman. She carries a metallic staff topped with a distinctive crescent shape. Advances with a soldier's confidence, guided by some sort of compass... Her staff is actually a device of immense power. She points it at the ground. Heads emerge, built layer upon layer like 3-D printing, made from the earth itself... The staff's technology grants her the ability to create humanoid figures, soulless and robotic." The insider also claims that Rita will be introduced in the reboot's prologue, during the dinosaurs' last day on Earth in the "cretaceous period," where she is seen fighting the Power Rangers of that era. In the original TV series, Rita Repulsa is released from captivity after more than 10,000 years, and it's possible that this prologue may show how she ended up there in the first place. During the prologue scene, it is also revealed that the Red Ranger is another fan favorite, Zordon. Here's what the insider had to say about that character. "Though alien, he looks like a man in his 50s. Sinewy and strong, as if carved from some root that refused to die. A being of integrity and iron will." These details have yet to be confirmed, but if true, Rita Repulsa would surely be an easy choice for the villain, given how recognizable the character is to longtime fans of the franchise. It isn't known if the filmmakers plan on casting an unknown for Rita Repulsa as well, but hopefully we'll learn more information soon. What do you think about Rita Repulsa as the Power Rangers villain?